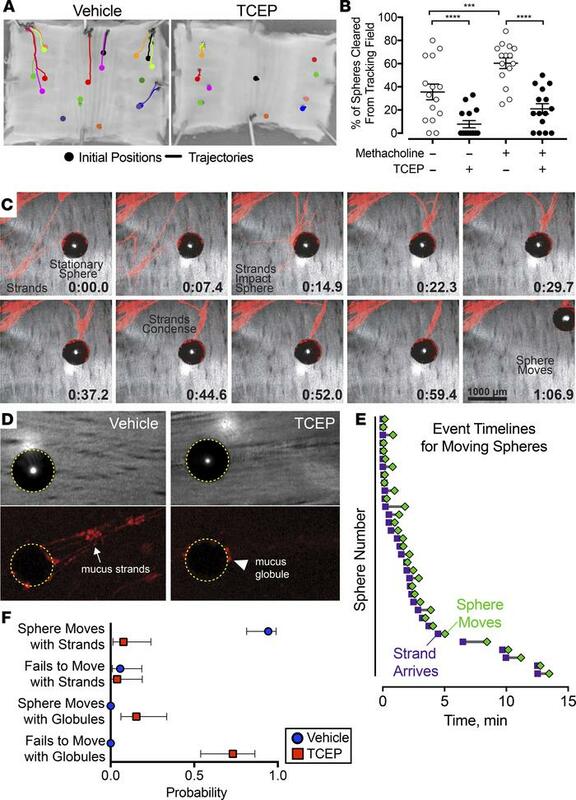 Reducing agents impair transport of spheres ex vivo. (A and B) Time-lapse photographic tracking of metallic spheres on segments of pig trachea in the presence or absence of reducing agents. (A) Images of ex vivo tracheal surface, with marks for initial positions (circles) and trajectories (lines) of spheres recorded over 15 minutes. The solution contained vehicle or 1 mM TCEP. (B) Percentage of spheres cleared from the airway (i.e., moved to the edge of the tissue). n = 15 per group; each data point represents a different pig. Lines and error bars represent mean ± SEM. Some error bars are hidden by symbols. ***P < 0.001, ****P < 0.0001 by 2-way repeated-measures ANOVA with Holm-Sidak’s post hoc multiple comparisons test. (C and D) Confocal microscopic images from methacholine-stimulated airways of mucus strands labeled with 40-nm fluorospheres (red). Reflected light is gray. Metallic spheres appear black. (C) Time course of mucus strands initiating movement of a stationary sphere. Dorsal surface of airways is in middle. Scale bar: 1000 μm. (D) Mucus attachment to spheres in the presence of vehicle or 1 mM TCEP. Top panels are reflected light images. Bottom panels show mucus labeled with fluorospheres (red). Dotted yellow circles mark outline of metallic spheres. The arrow marks mucus strands. The arrowhead marks mucus globules. Original magnification: ×4. (E) Timelines from methacholine-stimulated airways showing arrival of mucus strands (purple squares) and movement of spheres (green diamonds) (n = 33 spheres from 10 different pigs). (F) Probability of spheres moving in the presence of methacholine (100 μM) and the presence of vehicle (n = 35 spheres from 10 different pigs) or 1 mM TCEP (n = 26 spheres from 7 different pigs). Spheres were tracked for at least 15 minutes or until they moved. Symbols and error bars represent probability and 95% CI. P < 0.0001 by χ2 test.